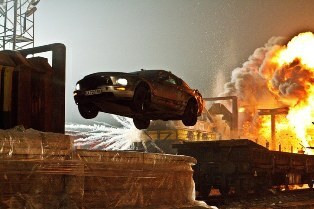 As I type this, the new car chase thriller Getaway has a one percent “Fresh” rating on Rotten Tomatoes. I don’t normally make it a practice of referring to critical mass when reviewing a film. Who cares what everyone else thinks, right? But when a major release has only managed to earn one solitary positive review (from Norman Wilmer of NOW Toronto), special note must be made. So how bad is Getaway? Bad enough that I actually had a mildly enjoyable experience with it. I wouldn’t recommend anyone rush out to see it in theaters. But when a movie builds a reputation this inescapably awful there’s always a chance that it’ll carve out a little cult following in spite of itself. 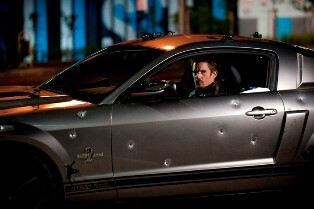 This is a 90-minute chase sequence that literally does away with any kind of substantial setup. Ethan Hawke is the washed-up former race car driver Brent Magna (not that he needs a name, most of the characters here don’t). We meet him as he’s stealing a Shelby Mustang Super Snake, burning rubber throughout a parking garage in Sofia, Bulgaria. The car has been outfitted with mini-cameras, all sending images back to a mysterious Voice (everyone seems to be saying who it is, but in case you don’t know I’ll treat it as a spoiler since the movie basically does, not revealing the actor until the very end). The Voice informs Brent that his wife has been kidnapped. She’ll be killed if Brent doesn’t do everything the Voice says. The owner of the car catches up to him, a young girl (whose name we never learn) played by Selena Gomez. Mandated by the Voice, she becomes Brent’s assistant. The film hardly pauses to catch its breath, which is actually a good thing. We get a tiny bit of a character development along the way, but really Getaway is a movie that you truly need to disconnect the rational, thinking part of your brain in order to even slightly enjoy. It’s hard to imagine what attracted Hawke to this movie. I guess for Gomez, this was another step in the maturation process that started with Spring Breakers. The problems is, while she turned in credible work in that earlier 2013 film, here she is strikingly miscast as a street smart, tough-talking tomboy. Her constant spouting off to Brent about her education gets annoying real quick, as does her constant use of PG-13-friendly curse words. She doesn’t have the voice, presence, or authority for a role like this (as preposterous as the character is to begin with). While Getaway isn’t quite worth the venom being spewed its way, it isn’t very well crafted. Much of the footage looks like it was shot with consumer-grade cameras (the kind attached in every corner of the car). The action is often incoherently shot (with endless, repetitive car crashes; don’t any of the police in Bulgaria know when to hit the brakes to avoid colliding with an obstacle?). But again, there’s no accounting for the cult potential in a so-bad-it’s-kinda-good action flick.